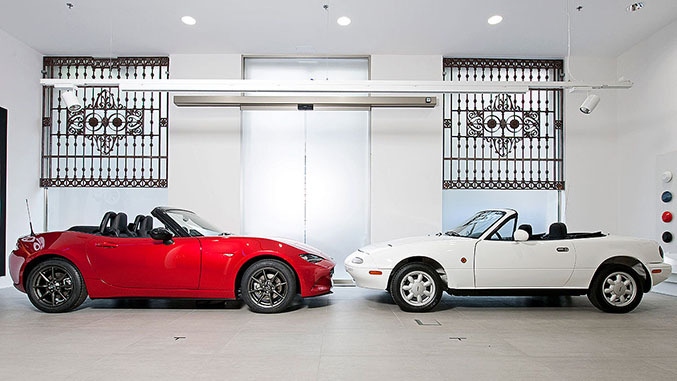 Multimedia Editor Chris Amos recently got a chance to drive the first-generation, or “NA” Mazda MX-5 and the all-new fourth generation – also known as the ND – back to back. Below are his impressions of the pair, and what differentiates the new model from its ancestor. Be sure to check out our review of the 2016 MX-5 and the ND MX-5 Cup Car. I'll start off by saying that you can't go wrong with either one of these cars. Because honestly, it's tough to say which one is more fun to drive. Ultimately, power and refinement set these two generations apart. For a Miata, the 2016 MX-5 is pretty dang quick. Gone are the days where you can drive around with the throttle pinned in every gear and not worry about breaking the speed limit. You can see in the video how much the ND pulls away from the NA out of the corners. After driving both cars back to back, I feel like the ND's newfound speed is a mixed blessing. In the ND, I found myself always having to check the speedometer to see how fast I was going, whereas in the NA that wasn't as much of the case - I could focus more on enjoying the driving experience. As far as refinement goes, the Miata has always been a well-built machine. Still, the NA is expected have the rattles and vibrations of a 22 year old car. In this case, our 1994 Miata test car had an exhaust rattle that was pretty noticeable between gear changes. In comparison, the new Miata feels downright luxurious. The chassis is stiff, with little noticeable flex and cowl shake, it's smooth and quiet over bumps, whereas the NA rattles and shakes. The driving position is much better in the ND Miata, I can't get over the feeling that you sit too high in the NA, and I'm only 5'10". Steering is quick and responsive with both cars. The NA was on winter tires, so its willingness to turn was muted slightly by about half an inch of squishy tread. Ultimately, I think the NA is still a bit more fun to drive. The biggest reason being that you can push it harder more of the time. It's also a bit more visceral to drive and gives the driver more feedback as to what's going on under the tires. The new Miata is really refined, but that refinement comes at the cost of muting some of that feedback. Still, the ND has a lot going for it. It stays true to form and well-represents the technological advances of the last 25 years. The new Miata is also very livable, and (in stock form) as a performance proposition is incredible value for the price. With the NA Miata - value to performance still outweighs what you'd get in a new Miata. NA will teach you to be a better driver, ND will reward you if you are a better driver.